Nordic Ware Commercial Original Bundt Muffin Pan with Premium Non-Stick Coating, 6-Cavity by Nordic Ware at My Beautiful Cake. MPN: 50602. Hurry! Limited time offer. Offer valid only while supplies last. The first Bundt muffin pan design. Our heavy cast aluminum bakeware provides superior baking performance. Features our premium non-stick coating. 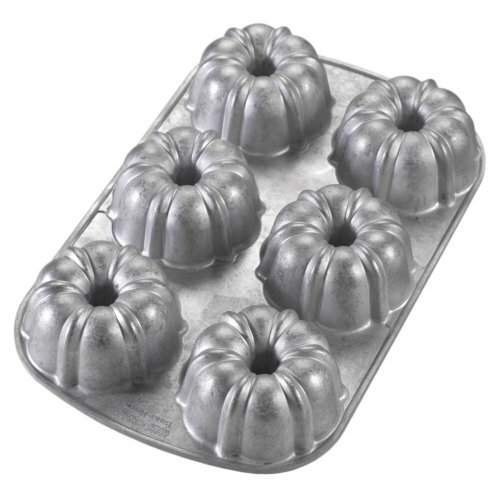 The first Bundt muffin pan design. Our heavy cast aluminum bakeware provides superior baking performance. Features our premium non-stick coating. Bake beautiful, elegant mini cakes with little effort. Makes six 1-cup, 4- by 2-inch mini Bundt cakes. Proudly made in the USA.